Mainly cloudy. Low 59F. Winds light and variable. 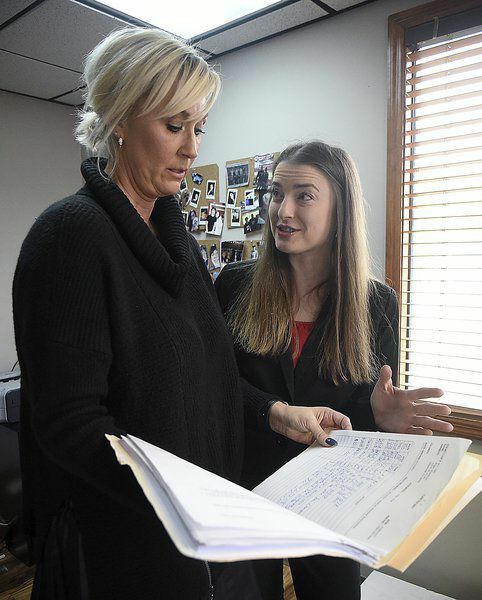 Paralegal April Reece talks with public defender Natalie Glaser at their Conasauga Judicial Circuit office. Wade Krueger has been the circuit public defender for the Southern Judicial Circuit for four years. The Southern Judicial Circuit serves five counties — Brooks, Colquitt, Echols, Lowndes and Thomas counties — with three offices in Lowndes, Thomas and Colquitt counties. Sam Dennis, a Valdosta-based lawyer with his own firm, said statutory sentencing and mandatory minimums push cases to plea deals. VALDOSTA, Ga. — Thousands of new felony cases are opened by the public defenders office each year. Less than a dozen will go to trial. The rest will plea guilty. Wade Krueger has been the public defender for the Southern Judicial Circuit for four years. 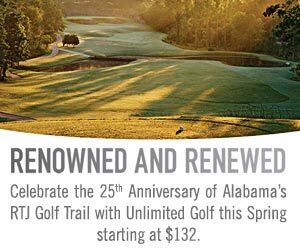 The Southern Judicial Circuit serves five counties — Brooks, Colquitt, Echols, Lowndes and Thomas counties — with three offices in the SunLight Project area of Lowndes, Thomas and Colquitt counties. Krueger said it is the client’s right to ask for a trial. He and his lawyers advise their clients but do not make decisions for them. “I tell clients all the time that this is my advise. They are free to take it or leave it, but it is my job to give it to them,” Krueger said. The Sixth Amendment of the Constitution guarantees the right to legal representation but the legal system encourages clients to plea guilty rather than have their day in court. The SunLight Project team looked at the public defenders offices in the Southern Judicial Circuit and the Conasauga Judicial Circuit. At the state level, the Georgia General Assembly passed the Georgia Indigent Defense Act of 2003 to ensure defendants who cannot afford an attorney will be provided one by the state in criminal cases. A public defender's office operates in 46 judicial circuits throughout the state. Funding for each of these offices is provided by the counties in each respective circuit, according to the law. In the Thomas County office, there are three attorneys. Two attorneys work in the Colquitt County office, and nine attorneys, including Krueger, in the Lowndes office. Come June, a 10th attorney will start in Lowndes. The public defenders office has a total budget of $2,665,902 which is nearly evenly broken up by state and county funds with $1,026,791 in state funds and $1,639,111 in county funds. Most of the county funds are dedicated to personnel costs, $1,376,320.68. Each county in the circuit contributes a share of the personnel budget that is determined by the county’s populations. For Brooks County, that’s 8.89 percent, 20.73 percent for Colquitt, 1.99 percent for Echols, 47.75 percent for Lowndes and 20.65 percent for Thomas. For the Conasauga Judicial Circuit, which includes Murray and Whitfield counties, the budget is $596,048 in county funding, with 28 percent of that being contributed by Murray County and 72 percent by Whitfield. The Conasauga public defender's office has 10 attorneys. In 2018, the Southern Judicial Circuit’s public defenders office opened about 3,500 cases for all five counties, Krueger said. Of those case, about 2,300 were new felony cases with the rest being probation violation cases. The office closed a total of 3,355 cases. Some of the cases may have been carried over from previous years. Of the cases closed, 1,121 of the cases were probation violation cases, which means the public defenders office closed 2,234 felony cases. Only eight cases for the year were taken to trial with four not guilty verdicts, three guilty verdicts and one split verdict, meaning the defendant was found not guilty for some charges and guilty for others. Fifty percent of clients who took their cases to trial rather than take the routine path of entering a guilty plea were found not guilty. 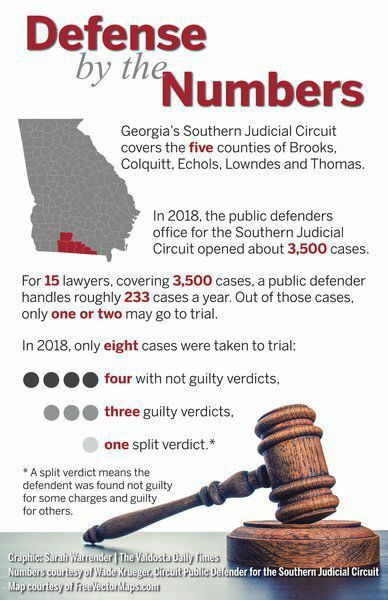 For 15 lawyers, covering 3,500 cases across five counties, a public defender in the Southern Judicial Circuit handles roughly 233 cases a year. Out of the cases, a defender may only take one or two to trial. Krueger said the case load is manageable, but extremely challenging. New cases are given out every day. As a public defender closes one case, a new case is being assigned, he said. Despite the large case load, Krueger said he doesn’t believe there is pressure for defenders to plea clients out. For example, if someone is charged with aggravated assault, Krueger said sentencing guidelines for that charge are one to 20 years in jail. The district attorney’s office can ask for any amount of time within that spectrum depending on the strength of the case. But if a client charged with aggravated assault goes to trial, the defendant will likely face 10 to 20 years if a jury returns a guilty verdict, he said. An armed robbery conviction comes with a minimum mandatory sentence of 10 years. The district attorney can offer the client a lesser charge of robbery, which comes with less time in jail. Most people choose not to take that chance, he said. “With things like that, I do think the system itself does encourage and heavily incentivizes guilty pleas over trials,” Krueger said. Jim Prine, a Thomasville-based senior assistant district attorney, said his office's interaction with public defenders is crucial to getting people through the system. "We've got a very good relationship with our public defenders," Prine said. A "good number" of cases do not take the traditional path. "A lot of times the public defender identifies cases that can be resolved and worked out with a plea deal," Prine said. The plea process saves court-related taxpayer dollars and the cost of keeping inmates in jail, he said. Natalie Glaser, a Conasauga public defender, said she feels no pressure to reach plea bargains in cases due to staffing or other issues. Sam Dennis, a Valdosta-based defense lawyer with his own firm, said statutory sentencing and mandatory minimums are what push cases to plea deals. Lawyers want to go to trial, he said, but their clients are afraid of the repercussions of losing and facing the harshest possible sentencing. He said people don’t get tried by a jury of their peers but by a member of the district attorney’s office. “Innocent people plea guilty every day in this country,” Dennis said. They are Sixth Amendment lawyers, which means they are included in the Constitution of United States, which guarantees a citizen's right to legal representation. There is a perception that those who can afford a private attorney such as Dennis have a higher likelihood of beating a charge but Dennis argues this isn’t always true. He said anyone should be happy to have a Sixth Amendment lawyer representing them. Instead, having a private lawyer shows that a person can afford to invest more resources into their case, and resources to a lawyer makes all the difference in the world. Public defenders and usually their clients are limited in time and money. Someone who pays to have a private lawyer is actually paying for their devoted attention. To be a public defender, and work for clients who have no one else, takes a special person, Dennis said. Krueger said it is a calling for many people. Public defender Glaser put it this way, "We are there to make sure that their constitutional rights are protected and that they have a voice in the process," she said. "We are part of the checks and balances of the judicial system. We make sure that all of the other actors do what they are supposed to be doing." In addition to Thomas Lynn and Derrek Vaughn, SunLight Project team members Patti Dozier and Charles Oliver contributed to this report.